The Nolensville Farmers Market was a prescribed dream for a hungry community. Dr. Miro Bandalo, current market Vice President, and several of his patients wanted access to fresh, local foods. After some envisioning and planning, he assembled the market’s Board of Directors. Other community markets graciously allowed some of the board members to shadow and learn more about the ins and out of farmers market procedures, thus the young market came to be. In its 4th season, Nolensville stays true to its purpose and provides access to healthy, local produce. Join the Nolensville community and follow along as the takeover our Instagram for the next two weeks. Kasi Haire: The Nolensville Farmer’s Market will be starting our 4th summer season this May. Our Board of Directors is compromised of Nolensville-area business owners and managers who care about access to local, healthy food options. We have 1 paid employee, myself – the market manager. We average about 30 vendors throughout the summer. We are a producer-only market and visit each of our vendors’ growing/cooking sites. KH: The Nolensville Market has both indoor and outdoor vendors. We are a suburb of Nashville. 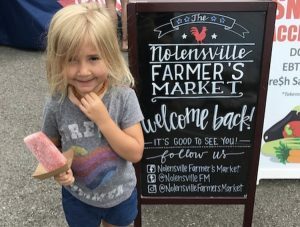 The Nolensville Market operates the Nolensville location as well as a new location called Berry Farms in South Franklin. We have a physical market throughout the summer and offer local goods via a website for the winter months. The Nolensville market sets up at the Historic Nolensville School right off of a state highway. We utilize the school’s old gym as well as a side parking lot for the market. KH: The Nolensville Farmer’s Market accepts and doubles SNAP Dollars with the help of the Fresh Savings by AARP grant. We get the community involved by opening the market with a food truck festival since food trucks are not typically allowed in Nolensville unless for a specific event and end the season with a Farm-to-Table Dinner. We offer events such as cooking demos, sampling, kids activities, yoga at the market, live music and so much more at each of our market days. KH: The biggest promotion for the market is through Facebook. We have over 5,100 Facebook followers. Its the best, free advertising around. Utilizing the Facebook ads and post boosts as well as Facebook Live videos has increased our FB presence. Customers are able to tune into our FB Live feed before the Market opens for a sneak peak at what is available that day. KH: Our biggest challenge has been finding volunteers or help with special events. This year, we hope to bring on someone that will focus only on our monthly special event, food truck festival and farm to table dinner. The Nolensville Farmer’s Market proudly partners with area-businesses to help fund the market, advertising and more. We also support several other non-profits in the area financially and by giving them a space to reach more customers at the market, free of charge. KH: The vibe at the Nolensville Farmer’s Market is unlike any other. Our vendors are friends, not competitors. We forge personal relationships with our vendors and their families. We say, if we wouldn’t invite them into our home to have dinner with our family, then they probably won’t be a good fit for our market. We truly care about representing each of our vendor’s business with as much passion as they put into their own. The Nolensville community still has that small-town, welcoming feeling. Its a great thing to be a part of each weekend.